Adolescent obesity in the United States has many important implications for both the health and well-being of the individual and society. Specific negative impacts of obesity on health include increased susceptibility to a host of diseases, chronic health disorders, psychological disorders, and premature death, which in turn add billions of dollars in health care costs each year. 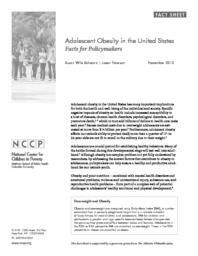 Excess medical costs due to overweight adolescents are estimated at more than $14 billion per year. Furthermore, adolescent obesity affects our nation's ability to protect itself; more than a quarter of 17- to 24-year-olds are not fit to enroll in the military due to their weight. Adolescence is a crucial period for establishing healthy behaviors. Many of the habits formed during this developmental stage will last well into adulthood. Although obesity is a complex problem not yet fully understood by researchers, by addressing the known factors that contribute to obesity in adolescence, policymakers can help ensure a healthy and productive adulthood for our nation's youth. Obesity and poor nutrition — combined with mental health disorders and emotional problems, violence and unintentional injury, substance use, and reproductive health problems — form part of a complex web of potential challenges to adolescents' healthy emotional and physical development.